"Kerguelen" redirects here. For other uses, see Kerguelen (disambiguation). 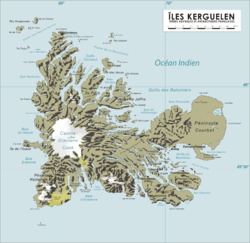 The Kerguelen Islands (/kərˈɡeɪlən/ or /ˈkɜːrɡələn/; in French commonly Îles Kerguelen but officially Archipel des Kerguelen, pronounced [kɛʁɡelɛn]), also known as the Desolation Islands (Îles de la Désolation in French), are a group of islands in the Antarctic constituting one of the two exposed parts of the Kerguelen Plateau, a large igneous province mostly submerged by the southern Indian Ocean. They are among the most isolated places on Earth, located 450 km (280 mi) northwest of the uninhabited Heard Island and McDonald Islands and more than 3,300 km (2,100 mi) from Madagascar, the nearest populated location (excluding the Alfred Faure scientific station in Île de la Possession, about 1,340 km, 830 mi from there, and the non-permanent station located in Île Amsterdam, 1,440 km, 890 mi away). 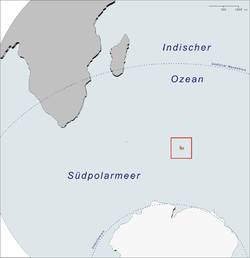 The islands, along with Adélie Land, the Crozet Islands, Amsterdam and Saint Paul Islands, and France's Scattered Islands in the Indian Ocean, are part of the French Southern and Antarctic Lands and are administered as a separate district. The main island, Grande Terre, is 6,675 km2 (2,577 sq mi) in area and is surrounded by a further 300 smaller islands and islets, forming an archipelago of 7,215 km2 (2,786 sq mi). The climate is raw[clarification needed] and chilly with frequent high winds throughout the year. The surrounding seas are generally rough and they remain ice-free year-round. There are no indigenous inhabitants, but France maintains a permanent presence of 45 to 100 soldiers, scientists, engineers and researchers. There are no airports on the islands, so all travel and transport from the outside world is conducted by ship. The islands are named after the French explorer Yves-Joseph de Kerguelen-Trémarec. Kerguelen Islands appear as the "Ile de Nachtegal" on Philippe Buache's map from 1754 before the island was officially discovered in 1772. The Buache map has the title Carte des Terres Australes comprises entre le Tropique du Capricorne et le Pôle Antarctique où se voyent les nouvelles découvertes faites en 1739 au Sud du Cap de Bonne Esperance ('Map of the Southern Lands contained between the Tropic of Capricorn and the Antarctic Pole, where the new discoveries made in 1739 to the south of the Cape of Good Hope may be seen'). It is possible this early name was after Abel Tasman's ship De Zeeuwsche Nachtegaal. On the Buache map, "Ile de Nachtegal" is located at 43°S, 72°E, about 6 degrees north and 2 degrees east of the accepted location of Grande Terre. 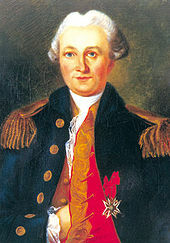 The islands were officially discovered by the French navigator Yves-Joseph de Kerguelen-Trémarec on 12 February 1772. The next day Charles de Boisguehenneuc landed and claimed the island for the French crown. Yves de Kerguelen organised a second expedition in 1773 and arrived at the "baie de l'Oiseau" by December of the same year. On 6 January 1774 he commanded his lieutenant, Henri Pascal de Rochegude, to leave a message notifying any passers-by of the two passages and of the French claim to the islands. Thereafter, a number of expeditions briefly visited the islands, including that of Captain James Cook in December 1776 during his third voyage, who verified and confirmed the passage of de Kerguelen by discovering and annotating the message left by the French navigator. Christmas Harbour, Kerguelens Land, 1811, by the English engraver George Cooke. 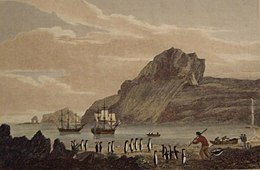 Soon after their discovery, the archipelago was regularly visited by whalers and sealers (mostly British, American and Norwegian) who hunted the resident populations of whales and seals to the point of near extinction, including fur seals in the 18th century and elephant seals in the 19th century. The sealing era lasted from 1781 to 1922 during which time 284 sealing visits are recorded, nine of which ended when the vessel was wrecked. Modern industrial sealing, associated with whaling stations, occurred intermittently between 1908 and 1956. Since the end of the whaling and sealing era, most of the islands' species have been able to increase their population again. Relics of the sealing period include trypots, hut ruins, graves and inscriptions. In 1800, Hillsborough spent eight months sealing and whaling around the islands. During this time Captain Robert Rhodes, her master, prepared a chart of the islands. That vessel returned to London in April 1801 with 450 tuns of sea elephant oil. 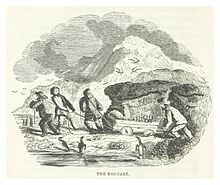 In 1825, the British sealer John Nunn and three crew members from Favourite were shipwrecked on Kerguelen until they were rescued in 1827 by Captain Alexander Distant during his hunting campaign. Illustration from John Nunn's book about the three years he and his shipwrecked crew survived on the island in the 1820s. The islands were not completely surveyed until the Ross expedition of 1840. The Australian James Kerguelen Robinson (1859–1914) was the first human born south of the Antarctic Convergence, on board the sealing ship Offley in Gulf of Morbihan (Royal Sound then), Kerguelen Island on 11 March 1859. For the 1874 transit of Venus, George Biddell Airy at the Royal Observatory of the UK organised and equipped five expeditions to different parts of the world. Three of these were sent to the Kerguelen Islands. The Reverend Stephen Joseph Perry led the British expeditions to the Kerguelen Islands. He set up his main observation station at Observatory Bay and two auxiliary stations, one at Thumb Peak (49°30′47.3″S 70°10′18.1″E﻿ / ﻿49.513139°S 70.171694°E﻿ / -49.513139; 70.171694) led by Sommerville Goodridge, and the second at Supply Bay (49°30′47.3″S 69°46′13.2″E﻿ / ﻿49.513139°S 69.770333°E﻿ / -49.513139; 69.770333) led by Cyril Corbet. Observatory Bay was also used by the German Antarctic Expedition led by Erich Dagobert von Drygalski in 1902–03. In January 2007, an archaeological excavation of this site was carried out. In 1874–1875, British, German and U.S. expeditions visited Kerguelen to observe the transit of Venus. In 1877 the French started a coal mining operation; however, this was abandoned soon after. In response to German operations in the area, France reasserted its sovereignty on the Kerguelen Islands, along with the islands of Amsterdam and St Paul, and the Crozet archipelago in 1893, and decided to administer these territories from Madagascar in 1924 (in addition to that portion of Antarctica claimed by France and known as Adélie Land; as with all Antarctic territorial claims, France's possession on the continent is held in abeyance until a new international treaty is ratified that defines each claimant's rights and obligations). The German auxiliary cruiser Atlantis called at Kerguelen during December 1940. During their stay the crew performed maintenance and replenished their water supplies. This ship's first fatality of the war occurred when a sailor, Bernhard Herrmann, fell while painting the funnel. He is buried in what is sometimes referred to as "the most southerly German war grave" of World War II. Kerguelen has been continually occupied since 1950 by scientific research teams, with a population of 50 to 100 frequently present. There is also a French satellite tracking station. The main island of the archipelago is called La Grande Terre. It measures 150 km (93 mi) east to west and 120 km (75 mi) north to south. Port-aux-Français, a scientific base, is along the eastern shore of the Gulf of Morbihan on La Grande Terre at 49°21′S 70°13′E﻿ / ﻿49.350°S 70.217°E﻿ / -49.350; 70.217﻿ (Port-aux-Français). Facilities there include scientific-research buildings, a satellite tracking station, dormitories, a hospital, a library, a gymnasium, a pub, and the chapel of Notre-Dame des Vents. Anse Betsy [Betsy Cove] (a former geomagnetic station at 49°10′S 70°13′E﻿ / ﻿49.167°S 70.217°E﻿ / -49.167; 70.217﻿ (Anse Betsy)), on Baie Accessible [Accessible Bay], on the north coast of the Courbet Peninsula. On this site an astronomical and geomagnetic observatory was erected on 26 October 1874 by a German research expedition led by Georg Gustav Freiherr von Schleinitz. The primary goal of this station was the 1874 observation of the transit of Venus. Armor (Base Armor), established in 1983, is located 40 km (25 mi) west of Port-aux-Français at the bottom of Morbihan Gulf, for the acclimatization of salmon to the Kerguelen islands. Baie de l'Observatoire [Observatory Bay] (a former geomagnetic observation station at 49°21′S 70°12′E﻿ / ﻿49.350°S 70.200°E﻿ / -49.350; 70.200﻿ (Baie de l'Observatoire)), just west of Port-Aux-Français, on the eastern fringe of the Central Plateau, along the northern shore of the Golfe du Morbihan. Cabane Port-Raymond (scientific camp at 49°20′S 69°49′E﻿ / ﻿49.333°S 69.817°E﻿ / -49.333; 69.817﻿ (Cabane Port-Raymond)), at the head of a fjord cutting into the Courbet Peninsula from the south. Cap Ratmanoff (geomagnetic station at 49°14′S 70°34′E﻿ / ﻿49.233°S 70.567°E﻿ / -49.233; 70.567﻿ (Cap Ratmanoff)), the eastmost point of the Kerguelens. La Montjoie (scientific camp at 48°59′S 68°50′E﻿ / ﻿48.983°S 68.833°E﻿ / -48.983; 68.833﻿ (La Montjoie)), on the south shore of Baie Rocheuse, along the northwestern coast of the archipelago. Molloy (Pointe Molloy), a former observatory 10 kilometres (6.2 mi) west of the present-day Port-Aux-Français, along the south coast of the Courbet Peninsula, or northern shore of the Golfe du Morbihan (Kerguelen), at 49°21′38″S 70°3′50″E﻿ / ﻿49.36056°S 70.06389°E﻿ / -49.36056; 70.06389﻿ (Molloy). An American expedition led by G. P. Ryan erected a station at this site on 7 September 1874. That station was also established to observe the 1874 transit of Venus. Port Bizet (seismographic station at 49°31′12″S 69°54′36″E﻿ / ﻿49.52000°S 69.91000°E﻿ / -49.52000; 69.91000﻿ (Port Bizet)), on the northeastern coast of Île Longue. This also serves as the principal sheep farm for the island's resident flock of Bizet sheep. Port Christmas (a former geomagnetic station at 48°41′S 69°03′E﻿ / ﻿48.683°S 69.050°E﻿ / -48.683; 69.050﻿ (Port Christmas)), on Baie de l'Oiseau, in the extreme northwest of the Loranchet Peninsula. This place was so named by Captain James Cook, who re-discovered the islands and who anchored there on Christmas Day, 1776. This is also the place where Captain Cook coined the name "Desolation Islands" in reference to what he saw as a sterile landscape. Port Couvreux (a former whaling station, experimental sheep farm, and geomagnetic station, at 49°17′S 69°42′E﻿ / ﻿49.283°S 69.700°E﻿ / -49.283; 69.700﻿ (Port Couvreux)), on Baie du Hillsborough, on the southeast coast of Presqu'île Bouquet de la Grye. Starting in 1912, sheep were raised here to create an economic base for future settlement. However, the attempt failed and the last inhabitants had to be evacuated, and the station abandoned, in 1931. The huts remain, as well as a graveyard with five anonymous graves. These are those of the settlers who were unable to survive in the harsh environment. Port Curieuse (a harbor on the west coast across Île de l'Ouest 49°22′S 68°48′E﻿ / ﻿49.367°S 68.800°E﻿ / -49.367; 68.800﻿ (Port Curieuse)). The site was named after the ship La Curieuse, which was used by Raymond Rallier du Baty on his second visit to the islands (1913–14). Port Douzième (literally Twelfth Port, a hut and former geomagnetic station at 49°31′S 70°09′E﻿ / ﻿49.517°S 70.150°E﻿ / -49.517; 70.150﻿ (Port Douzième)), on the north coast of Presqu'île Ronarch, southern shore of the Golfe du Morbihan. Port Jeanne d'Arc (a former whaling station founded by a Norwegian whaling company in 1908, and a former geomagnetic station at 49°33′S 69°49′E﻿ / ﻿49.550°S 69.817°E﻿ / -49.550; 69.817﻿ (Port Douzième)), in the northwestern corner of Presqu'île Jeanne d'Arc, looking across the Buenos Aires passage to Île Longue (4 km, 2.5 mi northeast). The derelict settlement consists of four residential buildings with wooden walls and tin roofs, and a barn. One of the buildings was restored in 1977, and another in 2007. From 1968 to 1981, 49°21′S 70°16′E﻿ / ﻿49.350°S 70.267°E﻿ / -49.350; 70.267﻿ (Rocket launch site) just east of Port-aux-Français was a launching site for sounding rockets, some for French (Dragon rockets), American (Arcas) or French-Soviet (Eridans) surveys, but at the end mainly for a Soviet program (M-100). Île Foch in the north of the archipelago, at 54 km2 (21 sq mi), the second most important offlier in the Kerguelens (49°0′S 69°17′E﻿ / ﻿49.000°S 69.283°E﻿ / -49.000; 69.283﻿ (Île Foch)). Île Saint-Lanne Gramont, is to the west of Île Foch in the Golfe Choiseul. It has an area of 45.8 km2 (17.7 sq mi). Its highest point reaches 480 m (1,570 ft) (48°55′S 69°12′E﻿ / ﻿48.917°S 69.200°E﻿ / -48.917; 69.200﻿ (Île Saint-Lanne Gramont)). Île du Port, also in the north in the Golfe des Baleiniers at 49°11′S 69°36′E﻿ / ﻿49.183°S 69.600°E﻿ / -49.183; 69.600﻿ (Île du Port), is the fourth largest satellite island with an area of 43 km2 (17 sq mi), near its centre it reaches an altitude of 340 metres (1,120 ft). The French supply ship Marion Dufresne makes regular calls at the Kerguelen Islands and typically carries a small contingent of tourists. Principal activities on the Kerguelen Islands focus on scientific research – mostly earth sciences and biology. The former sounding rocket range to the east of Port-aux-Français 49°21′S 70°16′E﻿ / ﻿49.350°S 70.267°E﻿ / -49.350; 70.267﻿ (FUSOV) is currently the site of a SuperDARN radar. Since 1992, the French Centre National d'Études Spatiales (CNES) has operated a satellite and rocket tracking station which is located 4 kilometres (2.5 mi) east of Port-aux-Français. CNES needed a tracking station in the Southern Hemisphere, and the French government required that it be located on French territory, rather than in a populated, but foreign, place like Australia or New Zealand. Agricultural activities were limited until 2007 to raising sheep (about 3,500 Bizet sheep – a breed of sheep that is rare in mainland France) on Longue Island for consumption by the occupants of the base, as well as small quantities of vegetables in a greenhouse within the immediate vicinity of the main French base. There are also feral rabbits and sheep that can be hunted, as well as wild birds. There are also five fishing boats and vessels, owned by fishermen on Réunion Island (a department of France about 3,500 km (2,200 mi) to the north) who are licensed to fish within the archipelago's exclusive economic zone. The Kerguelen islands form an emerged part of the submerged Kerguelen Plateau, which has a total area nearing 2.2 million km2 (0.85 million sq mi). The plateau was built by volcanic eruptions associated with the Kerguelen hotspot, and now lies on the Antarctic plate. The major part of the volcanic formations visible on the islands is characteristic of an effusive volcanism, which caused a trap rock formation to start emerging above the level of the ocean 35 million years ago. The accumulation is of a considerable amount; basalt flows, each with a thickness of three to ten metres, stacked on top of each other, sometimes up to a depth of 1,200 metres (3,900 ft). This form of volcanism creates a monumental relief shaped as stairs of pyramids. Other forms of volcanism are present locally, such as the strombolian volcano Mont Ross, and the volcano-plutonic complex on the Rallier du Baty peninsula. Various veins and extrusions of lava such as trachytes, trachyphonolites and phonolites are common all over the islands. No eruptive activity has been recorded in historic times, but some fumaroles are still active in the South-West of the Grande-Terre island. A few lignite strata, trapped in basalt flows, reveal fossilised araucarian fragments, dated at about 14 million years of age. Glaciation caused the depression and tipping phenomena which created the gulfs at the north and east of the archipelago. Erosion caused by the glacial and fluvial activity carved out the valleys and fjords; erosion also created conglomerate detrital complexes, and the plain of the Courbet Peninsula. 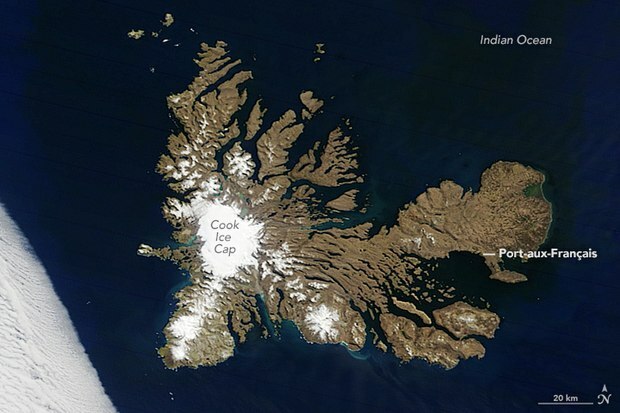 The islands are part of a submerged microcontinent called the Kerguelen sub-continent. The microcontinent emerged substantially above sea level for three periods between 100 million years ago and 20 million years ago. The so-called Kerguelen sub-continent may have had tropical flora and fauna about 50 million years ago. The Kerguelen sub-continent finally sank 20 million years ago and is now one to two kilometres (0.6 to 1.2 mi) below sea level. Kerguelen's sedimentary rocks are similar to ones found in Australia and India, indicating they were all once connected. Scientists hope that studying the Kerguelen sub-continent will help them discover how Australia, India, and Antarctica broke apart. Kerguelen's climate is oceanic, cold and extremely windswept. Under the Köppen climate classification, Kerguelen's climate is considered to be an ET or tundra climate, which is technically a form of polar climate, as the average temperature in the warmest month is below 10 °C (50 °F). Comparable climates include the Aleutian Islands, Campbell Island (New Zealand), Falkland Islands, Iceland, northern Kamchatka Peninsula, Labrador and Wollaston Islands. All climate readings come from the Port-aux-Français base, which has one of the more favourable climates in Kerguelen due to its proximity to the coast and its location in a gulf sheltered from the wind. The average annual temperature is 4.9 °C (40.8 °F) with an annual range of around 6 °C (11 °F). The warmest months of the year include January and February, with average temperatures between 7.8 and 8.2 °C (46.0 and 46.8 °F). The coldest month of the year is August with an average temperature of 2.1 °C (35.8 °F). Annual high temperatures rarely surpass 20 °C (68 °F), while temperatures in winter have never been recorded below −10 °C (14 °F) at sea level. Kerguelen receives frequent precipitation, with snow throughout the year as well as rain. Port-aux-Français receives a modest amount of precipitation (708 mm (27.9 in) per year) compared to the west coast which receives an estimated three times as much precipitation per year. The mountains are frequently covered in snow but can thaw very quickly in rain. Over the course of several decades, many permanent glaciers have shown signs of retreat, with some smaller ones having disappeared completely. The west coast receives almost continuous wind at an average speed of 35 km/h (22 mph), due to the islands' location in between the Roaring Forties and the Furious Fifties. Wind speeds of 150 km/h (93 mph) are common and can even reach 200 km/h (120 mph). Waves up to 12–15 m (39–49 ft) high are common, but there are many sheltered places where ships can dock. Due to the island's southern latitude, it experiences a couple of weeks from December to early January in which there is no true night, only astronomical twilight, meaning that sun illumination is barely distinguishable at nighttime. The islands are part of the Southern Indian Ocean Islands tundra ecoregion that includes several subantarctic islands. 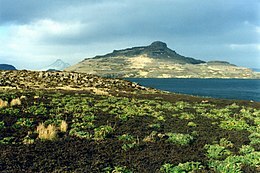 Plant life is mainly limited to grasses, mosses and lichens, although the islands are also known for the indigenous, edible Kerguelen cabbage, a good source of vitamin C to mariners. The main indigenous animals are insects along with large populations of ocean-going seabirds, seals and penguins. The wildlife is particularly vulnerable to introduced species and one particular problem has been cats. The main island is the home of a well-established feral cat population, descended from ships' cats. They survive on sea birds and the feral rabbits that were introduced to the islands. There are also populations of wild sheep (Ovis orientalis orientalis) and reindeer. In the 1950s and 1960s, French geologist Edgar Albert de la Rue began to introduce several species of salmonids. Of the seven species introduced, only brook trout Salvelinus fontinalis and brown trout Salmo trutta survived to establish wild populations. The islands appear in a number of fictional works. The title character in Edgar Allan Poe's 1838 novel, The Narrative of Arthur Gordon Pym of Nantucket, visits the islands. French writer Jules Verne's 1897 novel An Antarctic Mystery offers a follow up to Poe's book, and revisits the Kerguelen Islands. The 1874 short story "The Tachypomp" by Edward Page Mitchell tells of a hole through the center of the Earth with one end in the United States and the other in "Kerguellen's Land" (which is roughly antipodal to the United States and Canada ). In Kipling's poem "McAndrew's Hymn" – about a ship's engineer – there are the lines: "Fra' Cape Town east to Wellington – ye need an engineer. Fail there – ye've time to weld your shaft – ay, eat it, ere ye're spoke, Or make Kerguelen under sail – three jiggers burned wi' smoke!" Henry De Vere Stacpoole set his 1919 novel The Beach of Dreams on the islands. The Kerguelen Islands were the setting for a post-Second World War confrontation between W. E. Johns's recurring hero, Biggles and the crew of a gold bullion-bearing German U-boat, in the 1948 novel Biggles' Second Case. The fifth book in Patrick O'Brian's Aubrey–Maturin series, published in 1978, is entitled Desolation Island. French author Jean-Paul Kauffmann produced a non-fiction account of his 1991 journey to the islands, titled "The Arch of Kerguelen: Voyage to the Islands of Desolation". In 2000 British journalist and former Conservative MP Matthew Parris spent four months on Kerguelen, staying with the researchers at Port-aux-Français. A series of articles were published in The Times in which Parris charted his visit, and a documentary "To The Ends of Earth: Dreaming on Desolation Island" was produced for UK television, which aired on Channel 4. The islands inspired the 2008 song "The Loneliest Place on the Map" by singer Al Stewart. Kerguelen and island based research facilities are an important part of Craig A. Falconer's 2015 science fiction novel, "Not Alone" and sequel "Not Alone: Second Contact". ^ "Kerguelen, n." Oxford English Dictionary. 2017. Retrieved 2017-10-19. Pronunciation: /kəˈɡeɪlən/ /ˈkəːɡələn/ , respectively kər-GAY-lən or KUR-gə-lən. ^ "Kerguelen Islands". Encyclopædia Britannica. Retrieved 22 October 2016. ^ Delarue, Dominique. "Kerguelen – yves trémarec – james cook – asia – hillsborough – rhodes". Kerguelen-voyages.com. Archived from the original on 2 October 2013. ^ Delarue, Dominique. "Kerguelen – morell – john nunn – ross – ofley – challenger – fuller – eure – bossière". Kerguelen-voyages.com. Archived from the original on 26 April 2012. ^ Nunn, John (1850). Narrative of the Wreck of the "Favourite" on the Island of Desolation: detailing the adventures, sufferings and privations of J. Nunn, an historical account of the Island, and its whale and seal fisheries. London: William Edward Painter. p. 236. Retrieved 29 November 2014. ^ Quanchi, Max (2005). Historical Dictionary of the Discovery and Exploration of the Pacific Islands. The Scarecrow Press. pp. 87–88. ISBN 0810853957. ^ Carroll, Paul (29 June 2003). "19th Century History of Kerguelen Island, South Indian Ocean". Btinternet.com. Archived from the original on 30 July 2012. Retrieved 30 March 2012. ^ "Calotte Glaciaire Cook". Mapcarta. Retrieved 25 September 2016. ^ Kauffmann, Jean-Paul (2001). Voyage to Desolation Island. Random House. pp. 77–78. ISBN 1860469264. Retrieved 18 December 2012. ^ Serra, Jean-Jacques. "Bases temporaires" [Temporary Bases]. univ-perp.fr (in French). Retrieved 5 January 2019. ^ Borissova, Irina; Moore, Aidan M. G.; Sayers, Jacques; Parums, Robert; Coffin, Millard F.; Symonds, Philip A. (2002). "Geological Framework of the Kerguelen Plateau and Adjacent Ocean Basins". Geoscience Australia Record (2002/005). ^ "Southern Indian Ocean Islands tundra". Terrestrial Ecoregions. World Wildlife Fund. ^ Newton, Chris (2013). "The Monsters of Kerguelen". The Trout's Tale – The Fish That Conquered an Empire. Ellesmere, Shropshire: Medlar Press. pp. 161–170. ISBN 978-1-907110-44-3. ^ Sharma, Raja (2016). Ready Reference Treatise: The Narrative of Arthur Gordon Pym of Nantucket. Lulu Press. p. 41. ISBN 9781329804036. ^ Verne, Jules. An Antarctic Mystery. ^ Stilgoe, John R. (2003). Lifeboat. University of Virginia Press. p. 36. ISBN 9780813922218. ^ O'Brian, Patrick (1978). Desolation island (Jack Aubrey vol 5). Collins. ISBN 9780006499244. ^ Barnard, Jason; Stewart, Al (2016). "Al Stewart – Past, Present and Future". The Strange Brew. Retrieved 12 April 2016. ^ Falconer, Craig A. (2015). Not Alone. CreateSpace Independent Publishing Platform. p. 403. ISBN 9781522938088. ^ Falconer, Craig A. (2018). Not Alone:second Contact. CreateSpace Independent Publishing Platform. p. 2. ISBN 1719294488. 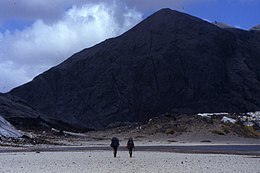 Wikivoyage has a travel guide for Kerguelen. "Cartography of the Kerguelen". Archived from the original on 13 April 2003. Retrieved 2007-04-02. CS1 maint: BOT: original-url status unknown (link)Including a toponymy index. "South Atlantic & Subantarctic Islands site, Kerguelen Archipelago page". Archived from the original on 29 November 2012. Wikimedia Commons has media related to Kerguelen Islands.